Industry Training is one of ? ve key mar- is a new 25,000 sq. ft. facility, with more ment housed in the new facilities is of seats available will exceed 350 in all ket divisions at MPT. The recent down- than 15,000 sq. ft. dedicated to simula- equally impressive, with a total of four classrooms, not including the conference turn in the price of oil, and the geo-po- tion. In addition to the new building, an full mission Class A simulators; three center or meeting hall. Maritime Professional Training (MPT) puses will receive signi? cant technology as well as new equipment for the Radar/ cording to Pecota. Resolve Marine Group space within the larger Power Lab to house the L3 simulator, and professional training courses using the new facility are due to begin in April 2015. California Maritime Academy hance the cruise experience for cadet students,” said Pecota. The upgrade includes expanded space for the instruc- tor’s operating room and server room, and additional workstations and moni- tors to allow for better simultaneous operation of the full mission bridge and classroom part-task simulators. Resolve Marine Group in Fort Lauder- dale has also invested recently in its sim- ulation facilities, to the tune of approxi- mately $1 million, according to Boldt. 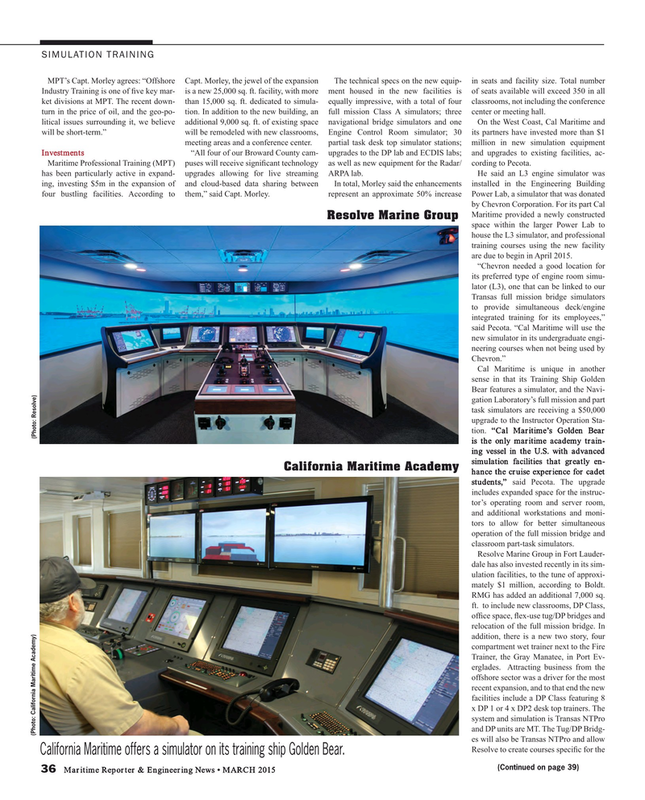 California Maritime offers a simulator on its training ship Golden Bear.